VAT on fruit juice and smoothies should be cut from 17.5% to 5% to help encourage healthy diets, the Lib Dem Treasury spokesman is to say. Vince Cable is expected to tell the party's spring conference in Liverpool the cut in duty would be paid for by a rise in tax on some alcoholic drinks. Such a tax could raise an estimated £200m, he will say. Health groups welcomed the idea but the Treasury said using taxes to promote public health could be problematic. Dr Cable's proposal comes the day after the Conservatives said they would raise tax on super-strength beer, cider and alcopops, in an attempt to target binge drinking, if they won the next general election. The Tories said they wanted to target the drinks they believe fuel yobbish behaviour, without penalising "sensible" drinkers. Dr Cable told the BBC: "As a politician I don't want to tell people how to conduct their diets. "All we want to do is to lift the very heavy burden from people who want to live a healthy lifestyle. A lot of people want good drinks that can reinforce their lifestyle and their fitness. "We should encourage people, not put people off who can't afford it." He said he wanted to transform the party from "one of beards and sandals to one of smoothies". Many weekly shopping items are "zero-rated" for VAT, but many drinks, including fruit juice, attract the full rate of 17.5%. 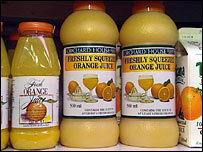 The tax rules mean cakes and frozen pizzas escape the duty for luxury goods, but 100% pure orange juice is taxed. Health groups have welcome the Liberal Democrats' proposal. A spokeswoman for the British Nutrition Foundation said: "We welcome anything that reduces the cost of healthy food so that people can improve their nutrition." An estimated 70% of the population do not consume the recommended five portions of fruit and vegetable per day. Drinks manufacturers have been campaigning for a tax cut on fruit juice for some time. A petition posted on the Downing Street website by the smoothie-makers Innocent has attracted more than 20,000 signatures in just a few months. Innocent Smoothies estimates an extra one billion portions of fruit would be consumed in the UK each year as a result of a tax cut. But using the tax system to improve the health of the population is fraught with political difficulty, according to Stuart Adams, of the Institute for Fiscal Studies. He said: "A change in the tax system always creates winners and losers. "If you cut taxes on fruit juices, for example, then fruit juice lovers do very well out of it, but the taxpayers who have to fund that tax cut may be less happy." Chancellor Alistair Darling is not expected to make a similar pledge on healthy drinks in his Budget on Wednesday. A Treasury spokesman said: "The 2004 Wanless report on public health highlighted difficulties of using the tax system to promote public health and stressed the importance of considering tax alongside alternative policy instruments to decide how health objectives, including the promotion of healthy eating, might be most cost-effectively achieved."